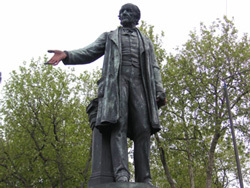 Over several years, we have devised and led themed, guided walks to explore aspects of London heritage. In our 'Royal Parks' season we explored the hidden corners of Regent's Park, Kensington Gardens and Hyde Park. Under the banner of 'Cemeteries and Graveyards' we delved into Brompton Cemetery, City Graveyards and Kensal Green Cemetery. And for our latest offering – 'Capital Connections: How transport and trade changed the face of London' – we investigated railways and canals at St Pancras and King's Cross, docks and dealing rooms at Canary Wharf, and Bazalgette's sewers and the Thames bridges around Embankment. Along the way, our walks have been spiced up by encounters with ghosts in the cemetery, Victorian shoe-shine boys and Georgian herb-sellers. Of course, this is just a taster. There's endless scope for guided walks in London – whether in East London, central London or beyond. Get in touch and together we can shape up an engaging guided walk season for your community group, workplace or organisation. We can also create self-guided heritage trails, such as our Spitalfields' Stories booklet and our Walk of the Month series for East End Life.